Note: The following was originally printed in the May/June 2017 edition of Mormonism Researched. To request a free subscription, please visit here. Nephi wrote down what his father saw, stating in verse 29 that he is not recording “all the words of my father.” Because of what he had seen, Lehi had a reason to rejoice in two of his sons, Nephi and Sam, and that he also supposed “that they, and also many of their seed, will be saved” (3). As for Lehi’s other two sons, Laman and Lemuel, Lehi saw in his dream “a dark and dreary wilderness” (4). In this dream, Lehi claimed that he saw a man in a white robe who told Lehi to follow him. After traveling for many hours “in darkness” (7), he prayed and asked the Lord to have mercy on him. After praying, he saw a “large and spacious field” (9); in that field he spotted “a tree, whose fruit was desirable to make one happy” (10). Lehi partakes of the fruit of the tree, claiming it “filled my soul with exceeding joy” (12). As a result he invited his wife, Sariah, and his sons Sam and Nephi, to also partake of the fruit as he did. He also encouraged his sons Laman and Lemuel to do the same, “but they would not come unto to me and partake of the fruit” (18). In this vision was a “straight and narrow path” (20), which came along a rod of iron and led to the tree, near to where Lehi was standing (20). He saw “numberless concourses of people, many of whom were pressing forward, that they might obtain the path which led to the tree,” but because of an” exceeding great mist of darkness,” “they wandered off and lost their way” (23). Others, however, took hold of the rod of iron and “pressing forward” through “the great mist of darkness,” reached the tree and partook of its fruit, but “did cast their eyes about as if they were ashamed” (24, 25). Lehi spoke of a “great and spacious building” that stood “as it were in the air, high above the earth” (26). The building is filled with people “mocking and pointing their fingers towards those who had come at and were partaking of the fruit” (27). Because of the ridicule, “they fell away into forbidden paths and were lost” (28). Still, others continued to press forward until they were able to partake of the tree’s fruit, while others “enter into that strange building,” and scorn Lehi and “those that were partaking of the fruit” (33). Because Laman and Lemuel did not partake of the fruit of the tree, Lehi feared for his sons, “lest they should be cast off from the presence of the Lord” (37). In 1 Nephi 11, Nephi gave an interpretation of his father’s vision. For example, he claimed that the rod of iron is the “word of God, which led to the fountain of living waters, or the tree of life; the tree being a “representation of the love of God” (25). The great and spacious building represents the pride and imaginations of the world (36). Though much has been said about this vision in Mormon circles, it was a discovery of a stone inscription found in 1941 that led to a lot of excitement among Latter-day Saints. Was Lehi’s vision really known among the inhabitants of Izapa, Chiapas, Mexico? Archaeologist Matthew W. Stirling made the discovery while he was heading a joint venture with the Smithsonian Institution and the National Geographic Society. Several stela were found in the area and given numbers, but one garnered special attention: Stela 5. It clearly shows a large tree in the middle of the carving. Stela 5 intrigued Dr. M. Wells Jakeman, chairman of the Department of Archaeology at Brigham Young University. Jakeman felt sure the inscription portrayed Lehi’s Vision of the Tree of life mentioned in 1 Nephi 8. If so, this would be a substantial piece of evidence towards proving that the Book of Mormon was an ancient text. Based on this anticipation, many Latter-day Saints referred to Stela 5 as the Lehi Stone. 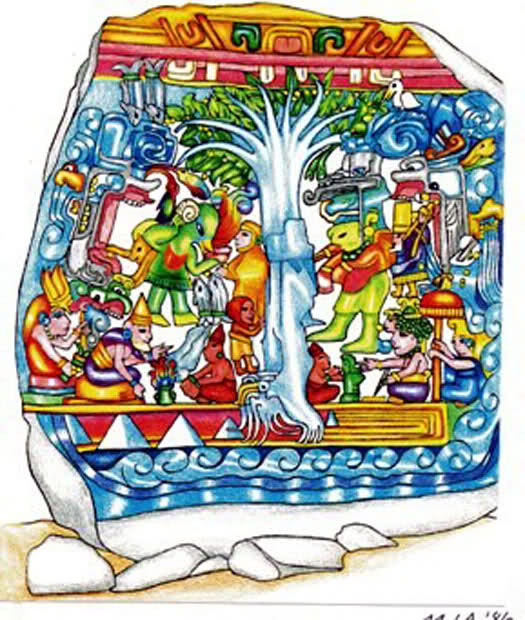 Jakeman’s study of the Stela 5 came, not from the stone itself but rather from a drawing of the stone he made from a photograph of the stone. From this drawing he numbered various characters and objects according to what he thought matched the story as found in 1 Nephi 8. Jakeman felt he had identified not only the tree, river, and iron rod mentioned in Lehi’s vision, but he also identified Book of Mormon characters, including Lehi, Sariah, and Nephi. His faith-promoting conclusions, while popular with many lay members in the Mormon church, were not so well received in the LDS scholarly community. A final warning should be issued against Jakeman’s Lehi Tree of Life Stone, which has received wide publicity in the Church and an over-enthusiastic response from the layman due to the publication’s pseudo-scholarship (74). As Nibley has pointed out in his own inimitable style, Jakeman errs at every turn in the publication. The basis of Jakeman’s evidence is his own hand-drawn version from a photograph of the stone. He makes unsupported assumptions about the canons of ancient art; he fumbles over elements of the dream which are not included and items on the stone which have no place in the dream; he displays ignorance of his linguistic data and most unfortunately reverses the scholarly method by presenting his data with a rash of ‘evidentlys,’ ‘probablys,’ ‘appears,’ and ‘apparentlys’ — but offers his conclusions as unarguable facts (75). Some Church authors have used Izapa Stela 5 as evidence for the Book of Mormon. However, at present, extreme caution should be used in invoking Izapa Stela 5 as evidence for the Book of Mormon’s historicity. Advances in our understanding of Mesoamerican art and iconography have led most LDS researchers with knowledge of the relevant disciplines to be very skeptical about a direct link between the stela and the Book of Mormon. It appears that Mormons must look elsewhere for the proof they seek.